I’m an avid watcher of Food Network and one of my Top 10 favorite personalities is the queen of Everyday Italian, Giada De Laurentiis. Not only have I watched her shows and spin offs, but I’ve also used many of her Italian-style recipes, including Chicken Piccata, to make simple recipes that taste restaurant quality. Just a few months after dining at Gordon Ramsay’s restaurant at the Horseshoe Casino in Baltimore, Gordon Ramsay Steak, I learned that another celebrity chef would be opening a restaurant in the casino. 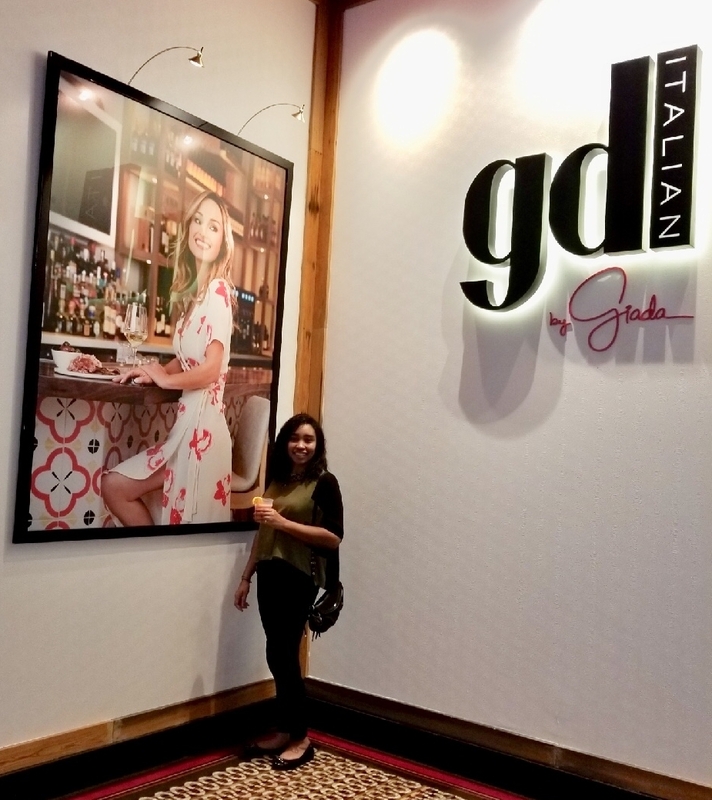 GDL Italian by Giada opened in May 2018. As her first East Coast restaurant, Giada added personal touches from the menu to the lighting and decor. I made my family and I a reservation for my mom’s birthday, excited to see what the Emmy Award-winning chef was serving Baltimore. Like any good meal with the Patterson family, we started with cocktails. GDL features eight cocktails as well as red and white wines. I later learned that De Laurentiis’ grandfather, Dino De Laurentiis, was a filmmaker and all of the cocktails are named after his movies. The wines come primarily from California and Italy to fit the restaurant’s theme. Even though Moscato is a dessert wine, I ordered a glass of the Risata Moscato d’Asti. The white sparkling wine was on the sweet side but I really enjoyed the notes of honey. I always love when a chef, especially a world-renowned chef, has an appreciation for the area where they are building their restaurant. The GDL menu stays true to De Laurentiis’ love for Italian-style cuisine, but she also made sure to incorporate local elements into the restaurant. Much like Gordon Ramsay Steak, GDL sources its meat from Roseda Farm in Monkton, Md. The seafood, also locally-sourced, comes from J.J. McDonnell & Co. Even the red brick pizza oven was designed by a company in Beltsville, Md. We started our meals with two of the antipasti, the Crab Arancini and the Burrata Caprese. I should mention that our server and the woman at the table next to us both recommended Giada’s Arugula Salad as a light and refreshing way to begin our meals. While I certainly didn’t know what arancini was, I saw the word crab and knew it would probably be good. Arancini is traditionally a stuffed rice ball that is deep fried. I’ve had many crab balls in my life, but the Crab Arancini at GDL was probably the best. Even though it clearly says the dish has rice in it, all I could taste was the sweet, seasoned crab meat. The outside of the ball had the perfect fry offering that sought-after crunch while not compromising the contents. Forever playing fast and loose with my lactose intolerance, I dove right into the creamy ball of burrata. The cheese was plated in olive oil and surrounded by basil pesto and roasted tomatoes. Toasted crostini served as the vessel to transport the caprese into my mouth. My dad discovered that he does not like burrata so since it was just my mom and I eating, it quickly wore us down. It took no time for our entrees to come. The GDL menu isn’t at all overwhelming and showcases six pasta dishes, eight entrees and four pizzas, including a build your own option. My dad and I both ordered the Rockfish Cacciatore, unique to the Baltimore menu, while my mom went with the Campanelle pasta. While rockfish is not an uncommon menu item, especially in Maryland, I was eager to see what kind of twist GDL would put on it. GDL serves the fish cacciatore style, meaning it is prepared with onions, herbs and other vegetables in traditional Italian fashion. This Rockfish Cacciatore also had roasted tomatoes and bell peppers and was topped with a potato chip gremolata. I was a little shocked that my dad ordered the rockfish over the Parmesan Crusted Pork Chop and bone-in Tuscan Ribeye. As he started to eat the dish, he raved about how the tender fish was prepared and how phenomenal the seasoned tomato sauce and accompanying vegetables were. I also thought the rockfish was outstanding but I got a little bit of food envy when took a bite of my mom’s pasta. Her bowl was filled to the top with campanelle pasta, shrimp and arugula in a spicy pomodoro sauce. Not only was the serving of pasta incredibly generous, GDL doesn’t skimp on the shrimp either. I didn’t think the pomodoro sauce was too spicy, but creamier thanks to the mascarpone. Maybe it’s for the best that I didn’t order that dish because it would’ve been a little tacky for me to lick the remaining sauce from the bowl in public. By the end of the meal, we were too full for dessert. I did, however, have enough room to order their frozen cocktail, the Anzio, to-go to take out into the casino. I also returned to the GDL bar for another after a bit of gambling. If the Horseshoe Casino’s sit-down restaurants were like Goldilocks and the three bears, GDL Italian would be “just right.” While the restaurant is casual like Guy Fieri’s, the atmosphere is more posh. Gordon Ramsay still sets the mark in fine dining, but GDL clearly isn’t serving your average pasta with red sauce. GDL Italian by Giada is the perfect middle ground for diners looking for more elevated cuisine in a trendy, easygoing environment. GDL Italian by Giada is located in the Horseshoe Casino at 1525 Russell St., Baltimore.